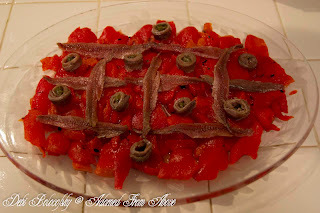 My husband loves anchovies, and my mom makes an appetizer with peppers and anchovies. When we were in California last week, she very kindly made it for him, so today, I am giving all of you the recipe. 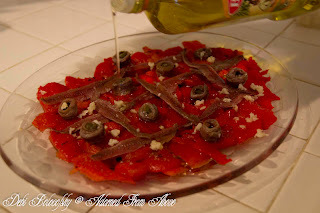 I don't like anchovies, but apparently if you do this is a great appetizer. Drain peppers and then lay them in a single layer on a plate. Next, you will lay the flat anchovies on top of the peppers in a window pane pattern. Then put the rolled anchovies in the center of each window pane. You are just trying to make it look pretty. Then sprinkle the crushed garlic over the top of the anchovies and peppers. Then sprinkle the pepper and chopped parsley. 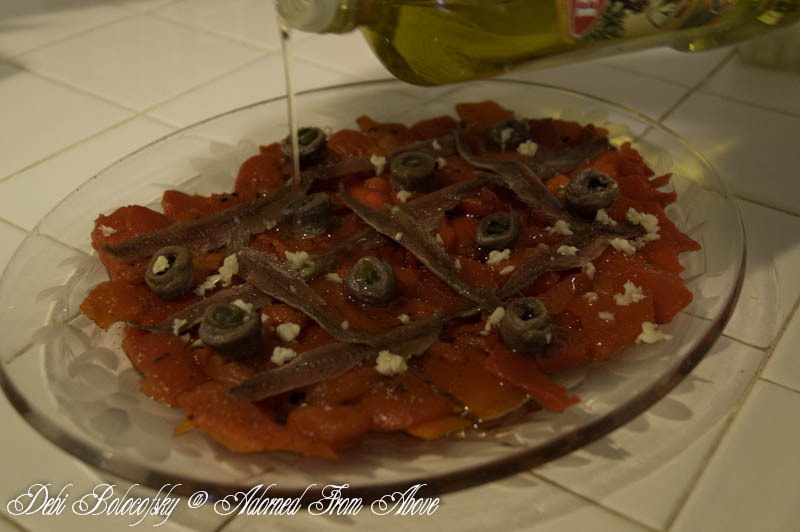 Next drizzle olive oil over the anchovies and peppers. Cover the plate and refrigerate for about 2 hours, so that the flavors come together. Serve with a fresh sliced baguette. I would love to hear what your favorite appetizers are. Send me your comments. Sounds great. My brother like anchovies too. Maybe I'll try this the next time he's here for a visit. Thanks for sharing at the All Star Block Party. Let me know if he likes it. Thanks for visiting and for hosting the party. Sounds savory. 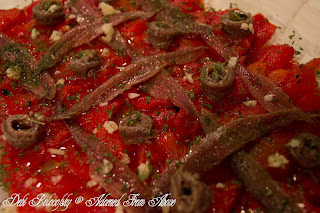 I am not sure if I like anchoviews, but I love sardines, so I would probably like this one. I will keep this one for the next family get together! 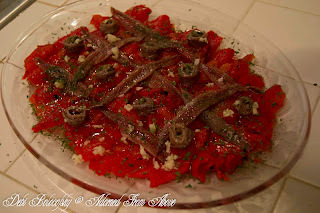 I don't like anchovies, so I don't ever eat this, but my husband and sister in law love it. Thanks for stopping by.